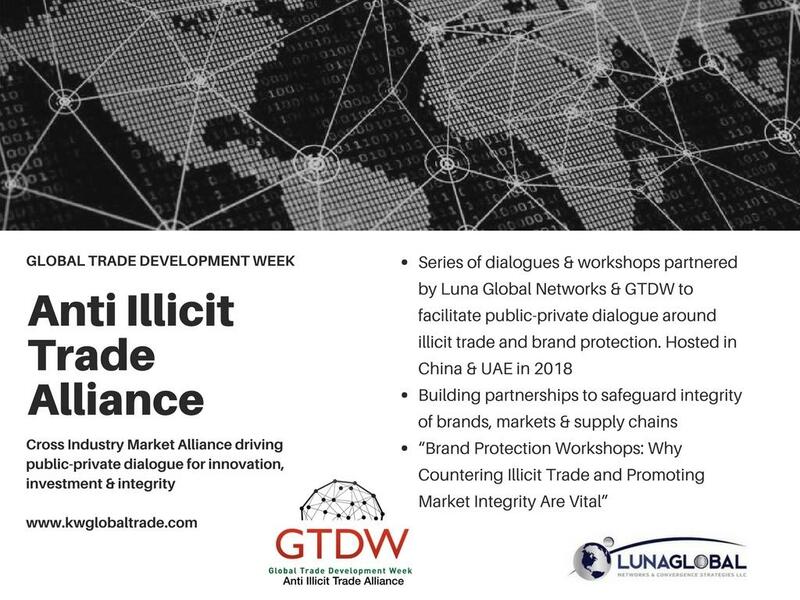 SHANGHAI, July 5, 2018 (Newswire.com) – On July 2-4, David M. Luna, President & CEO, Luna Global Networks & Convergence Strategies LLC participated in the China Global Trade Development Week (GTDW) and chaired the “Brand Protection: Anti-Illicit Trade” Workshop. The workshop held on July 4 brought together senior officials from across sectors, international organizations, and industries for frank and open discussions on ways to strengthen international cooperation to counter illicit trade, corruption, and converging security threats across borders, markets, and Free Trade Zones (FTZ). Numerous international organizations have estimated that today’s global illicit markets, and various forms of ‘convergence crime’, account for several trillions of U.S. dollars every year, to include the trafficking of drugs, persons, arms, counterfeit and pirated goods, illegal cigarettes and alcohol products, endangered wildlife, corrupt proceeds and illicit financial flows. Of equal concern is not only the current breadth and staggering scale of today’s illicit markets, but that many of them will double within five years’ time alone. I am a firm believer of net-centric synergies: a network of networks where dynamic collaborations, strategic alliances, and collective action can, and are, making a difference as partners work with each other across regions to tackle many of today’s transnational threats. For the reality is that no one economy or community is immune from these threats, such as corruption or cross-border illicit trade. The OECD informed on the important work and latest research of the OECD Task Force on Countering Illicit Trade including its latest report, “Why Do Countries Export Fakes?The Role of Governance Frameworks, Enforcement and Socio-economic Factors”. INTERPOL, World Trade Organization (WTO), and the International Trademark Association (INTA), and other international organizations, also participated at the China GTDW event this week. Other key highlights of the work included a briefing by Sam Radocchia, co-founder/CMO of Chronicled Inc., on how top illicit markets are becoming larger every day, and how blockchain can help curb illicit trade and promote smart supply chains because of its ability to create unique identities for individual items. Some brands and companies highlighted the need for effective sanctions and enforcement to counter illicit trade, and discussed how they partner with governments, investigate counterfeiting crimes in markets, and cooperate with law enforcement agencies. Luna Global Networks is also honored to be partnering with United Nations Interregional Crime and Justice Research Institute (UNICRI) on a new Dialogue at the Palais des Nations in Geneva (Switzerland) on UNICRI’s SIRIO program, and partnerships with the hi-tech sector and other interested industries and communities to combat illicit trade and transnational security threats by harnessing and leveraging innovative technologies such as blockchain. Luna Global Networks and KW Group are partnering with the GTDW Advisory Council to bring together action-oriented public and private sector leaders and doers from around the world to advance smart supply chain solutions through strategic alliances on the critical nexus between innovation and investment, and market integrity as part of the Global Trade Development Week (GTDW) Summit series. Luna Global Networks will chair the new GTDW Anti-Illicit Trade (AIT) Alliance that will bring new energies and attention to the harms and costs posed by illicit trade globally including in strategic markets such as China, United Arab Emirates (UAE), and other vibrant economies in 2018-2020. The next GTDW AITA meetings will be in Abu Dhabi November 20-22, and AITA II Dialogue and Roundtable in China in 2019. Find Mr. Luna’s Opening Statement @ https://www.linkedin.com/pulse/strategic-alliances-fighting-illicit-trade-across-david-m-. 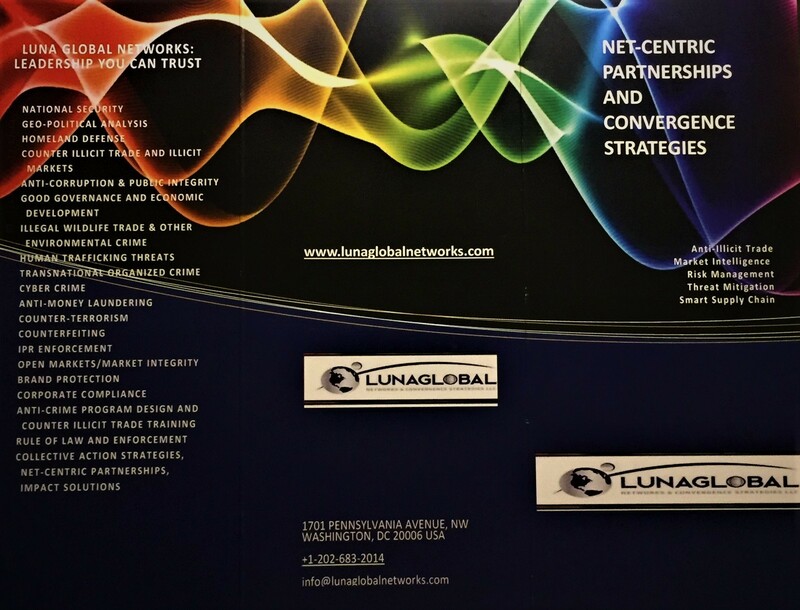 A Strategic Advantage: Luna Global Networks is an international security consultancy well-positioned to help businesses and NGOs tackle among the most pressing illicit trade and governance challenges and related security threats across borders, markets, and industries through convergence strategies and tactical plans that target an illicit threat environment more holistically; net-centric partnerships (a network of networks) that harness collective action through strategic alliances; and the designing of pragmatic training to counter illicit trade, leveraging of innovative net-centric capabilities, and the harnessing of transformative technologies that help produce greater results and more enduring solutions. Happy 4th of July to my American colleagues, and welcome to our GTDW friends. It is an honor to be chairing today’s GTDW Workshop on Brand Protection. I look forward to our discussion on why countering illicit trade and promoting market integrity are vital to protecting our economies, markets, and communities against harms and impacts that help finance webs of corruption and criminality all around the world and fuel greater insecurity and instability globally. Let me first thank Andrew Keable and Michelle Wong, KW Group, and the Global Trade Development Week (GTDW) Advisory Council – especially our two Chinese partners, the Asia Pacific Model E-Port Network Operational Center (APMEN APEC China) and the Center for China and Globalization (CCG) – for their leadership and support this week and in helping to institutionalize anti-illicit trade and related converging security threats as an integral element of the GTDW series in 2018-2020. I would also like to recognize the US-China Business Council (USCBC) for their attendance and engagement at this important Workshop. As we have discussed these first two days, trade promotion, customs compliance, economic development, free trade, and economic zones are critically important issues to governments and the private sector alike. Illicit trade and related corruption are threat multipliers that can impede broader economic and security objectives. In a world of convergence, many risks and threats are all inter-connected – each individually dangerous but whose sum represents a far greater threat across borders. Moreover, what happens in one market impacts many others. Having this event in Shanghai, China, including the launch of the new GTDW Anti-Illicit Trade Alliance, brings special memories for me personally, as it is near this venue down the street where during my service as an American diplomat, China and the United States hosted its first APEC U.S.-China Anti-Corruption meeting, and launched a new bilateral and historic partnership to work together on fighting corruption and illicit trade in this important region. In 2014, our fruitful partnership resulted in the APEC Leaders’ “Beijing Declaration” on fighting corruption, denying safe haven to corrupt officials, confiscating their illicitly-acquired assets, and on effectively enforcing anti-bribery laws. I am a firm believer of net-centric synergies: a network of networks where dynamic collaborations, strategic alliances, and collective action can, and are, making a difference as partners work with each other across regions to tackle many of today’s transnational threats. For the reality is that no one economy or community is immune from these threats, such as corruption or cross-border illicit trade. Similar to the fruitful bilateral cooperative framework of the U.S.-China Anti-Corruption Working Group (ACWG) of the Joint Liaison Group (JLG), which I co-chaired for more than 12 years and which yielded many important achievements and successes, we must be frank and honest with each other and among partners from different sectors, industries, and communities to address many of the threats that confront us, and to develop innovative market-based, rule-of-law solutions to counter illicit trade. What I learned during my over 20+ years of diplomatic work, including here in China working with colleagues from the National Supervision Commission (NSC), Central Commission for Discipline Inspection (CCDI), and other ministries and commissions, again is that trust, commitment, determination, and harnessing joint energies and strategic alliances anchored on mutual respect across sectors and industries are incredibly important, and respect for each other’s sovereignty and laws. I also thank NSC for their attendance here today. This is the spirit and essence of our Anti-Illicit Trade Alliance that we will be launching later today, because whole-of-societies approaches are critical to making progress against illicit trade and related corruption in strategic economies like China, the UAE, and many other dynamic investment frontiers and emerging markets. And as some of our speakers will highlight at our workshop, the global illegal economy is indeed booming and growing significantly every year. Numerous international organizations have estimated that today’s global illicit markets, and various forms of “convergence crime”, account for several trillions of US dollars every year, to include the trafficking of drugs, people (especially women and children), arms, counterfeit and pirated goods, illegal cigarettes and alcohol products, endangered wildlife, pillaged natural resources, and many other illicit commodities, corrupt proceeds and illicit financial flows. Of equal concern is not only the current breadth and staggering scale of today’s illicit markets, but that many of them will double within five years’ time alone. Building on the work of the OECD and its Task Force on Countering Illicit Trade, in a 2017 report by the International Chamber of Commerce’s Business Action to Stop Counterfeiting and Piracy (BASCAP) and the International Trademark Association (INTA), it is projected that the global economic value of counterfeit and pirated goods alone will reach close to $3 trillion by 2022. Internet on-line shopping and cybercrime also present a threat to companies and consumers alike. A recent report estimates that the financial costs from cybercrime will double from $US 3 trillion in 2015 to $US 6 trillion by 2021. In addition to dis-incentivizing innovation and economic damages, the impacts include reputational harm, stolen data, lost productivity, theft of intellectual property, and other costs. Illicit trade not only results in lost profits for companies, job displacements for workers, business closures, economic hardships for governments when less revenue is brought into the treasuries to fund public services, but also poses grave dangers to public health and safety. Illicit trade also has direct impacts on our communities when we realize that close to 40 million people are trafficked or in modern slavery (including millions of children in forced labor); or when communities are increasingly harmed every day from counterfeit medicines, tainted or contaminated food stuff, or when defective automotive and other illicit consumer products kill tens of thousands of people every year, if not more. Diversion, counterfeiting and smuggling of many of today’s leading brands are very lucrative for criminals — and in some cases, terrorist groups: it is a low-risk, high-reward business. As has been discussed this week in Shanghai at our China GTDW Summit, sustaining the economic benefits of Free Trade Zones (FTZs) is an important consideration for many market stakeholders. Free Trade Zones can have a “catalytic effect” on economies, including attracting Foreign Direct Investment and helping to expand economic growth. But in too many parts of the world, FTZs are also exploited on a daily basis by some to facilitate illicit activities that produce broader market reputational harm and put the physical security of many communities in danger. The misuse of illicit trade and associated criminality in one FTZ can have serious security ripple effects in other FTZs all around the world. Such connectivity and convergence between the world’s various free trade zones help to create a bigger cross-border threat altogether as some reports have underscored. For example, payments for counterfeits being trafficked through the UAE from China and on to Africa may eventually wind up in Panama or Europe, where they then help to fund other types of illegal activity, be it more illicit trade or other forms of criminality. So what do we do about these harms and threats? And how can we begin working across borders and across communities to mitigate the impacts of illicit trade through our new GTDW Anti-Illicit Trade Alliance, as we partner with other networks and cross sectors and borders to counter these threats and disrupt illicit markets? Evidence-based research from the OECD, for example, to the findings by The Economist Intelligence Unit (EIU) on the new Global Illicit Trade Environment Index which our keynote speaker will discuss shortly, certainly contribute to helping us understand the current security threat landscapes posed by illicit trade. Harnessing international cooperation is vitally important and it is great to have numerous international organizations with us today including INTERPOL, the World Trade Organization (WTO), the World Customs Organizations (WCO), the Organization for Economic Cooperation and Development (OECD), the United Nations, International Trademark Association (INTA), International Chamber of Commerce (ICC), Asia Pacific Model E-Port Network Operational Center (APMEN), International Network of Customs Universities (INCU), and many others. Private sector leadership is indispensable, and it is a great honor to have with us this week many leading brands and businesses committed to countering illicit trade globally, that will share their case studies and best practices. Finally, I am a big proponent of finding innovative ways to leverage transformative technologies to combat today’s transnational threats. Anti-counterfeiting strategies and brand protection technologies such as track and trace can help to pinpoint supply chain strengths, weaknesses, and vulnerabilities, criminal exploitation, and brand diversion in cyberspace or in retail stores. I also believe blockchain technology is potentially a game-changer across industries to more effectively counter illicit trade and other threats. This is why we have added blockchain and other important technologies – such as those being advanced by Chronicled Inc., I-Trace Technologies, and APMEN – to our agenda to help communities stop fakes, deadly medicines or other harmful products from entering global supply chains, or to address product diversion from distribution systems. Luna Global Networks is also honored to by partnering with United Nations Interregional Crime and Justice Research Institute (UNICRI) on a new Dialogue at the Palais des Nations in Geneva (Switzerland) on UNICRI’s SIRIO program, and partnerships with the hi-tech sector and other interested industries and communities to combat illicit trade and transnational security threats by harnessing and leveraging innovative technologies such as blockchain. Transformative technologies such as advanced analytics, network mapping, and data visualization are also very powerful tools that can help law enforcement communities and industries to identify emerging trends and patterns to anticipate threats, to target specific illicit hubs, and to investigate bad actors engaged in various cross-border trafficking crimes. In closing, I believe that we must fight back on all levels across global security landscapes and through more holistic, multi-dimensional, and coordinated courses of action. International cooperation and shared responsibility-focused partnerships and alliances are critical including those that promote effective sanctions and enforcement. Strategic alliances across sectors and industries can be a powerful voice and unifying force to more effectively fight illicit trade across borders, markets, and FTZs. Through a united front (strength in numbers) and collective action (a network of networks), we can positively change the dynamics across illicit markets, and help to strengthen greater political will, international cooperation, and enforcement actions against today’s bad actors and illicit networks. With such coordinated energies and public-private partnerships, we can do more together to tackle these converging illicit harms and security threats including through our new Anti-Illicit Trade Alliance (AITA) in strategic markets. Without further ado, it is an honor to invite our keynote speaker, Chris Clague, Managing Editor, and Global Editorial Lead, Trade and Globalization, The Economist Intelligence Unit (EIU), who will help sharpen and inspire our dialogue today, and who will also inform us of the new EIU Global Illicit Trade Environment Index 2018.